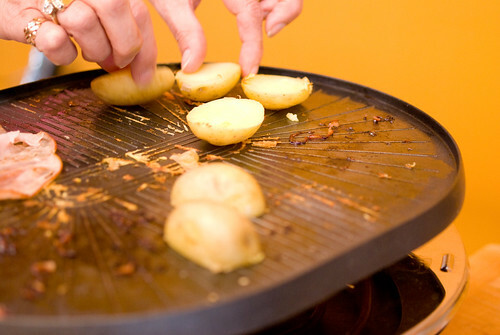 Have you eaten raclette? It’s a semi-soft, slightly stinky cheese from Switzerland, and it’s fantastic melted. We’ve bought it before, usually to put on hamburgers – a use I highly recommend. 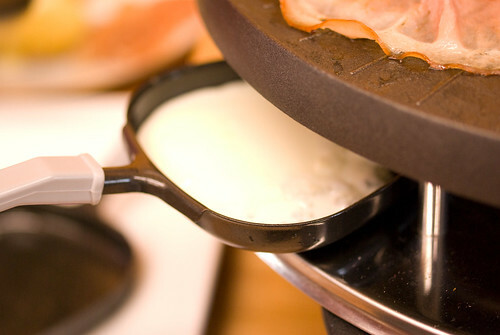 However, I had never had it served in the traditional manner, melted and poured over bread and vegetables, so when John DeGloria over at Slough Food announced a Raclette Night, we were keen to go. 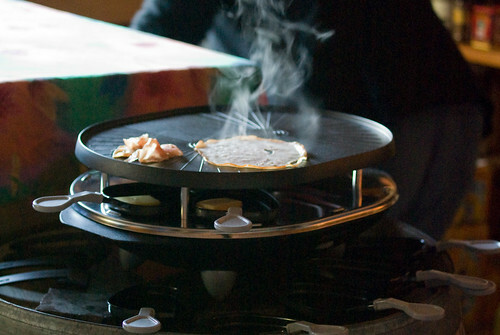 The premise is simple, made even simpler with these nifty raclette grills. 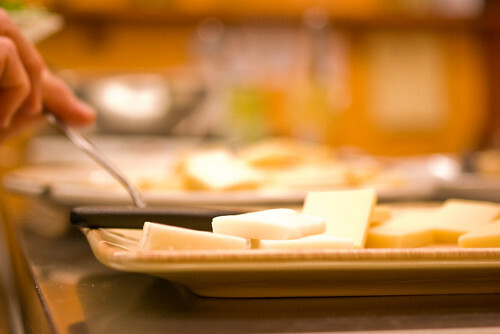 Unlike fondue, where you melt the cheese and dip stuff in it, here you melt the cheese and pour it over other stuff. 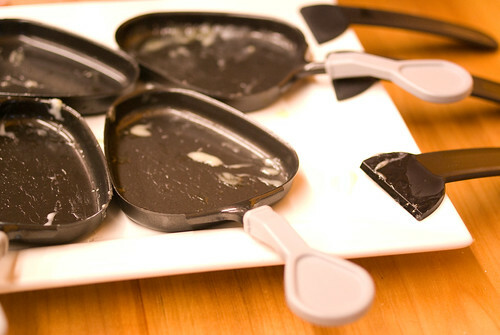 There are cute little Teflon dishes to put under the broiler, and while the cheese heats up you can toast bread, or halved potatoes, or ham, or whatever you like on the top griddle. Once we all had the idea, we were turned loose on the grills and a counter full of ingredients. 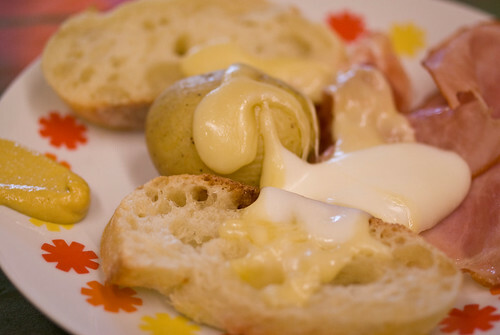 There were steamed potatoes, good bread, ham, prosciutto, several kinds of cheese (including raclette, of course), and a tossed green salad. Since you are just heating up a bit of food at a time, you can stretch out a meal for hours. 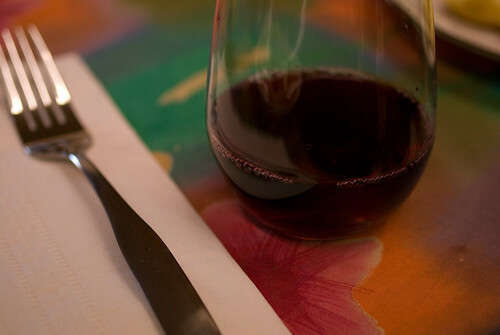 An excellent opportunity to go through some good wine. 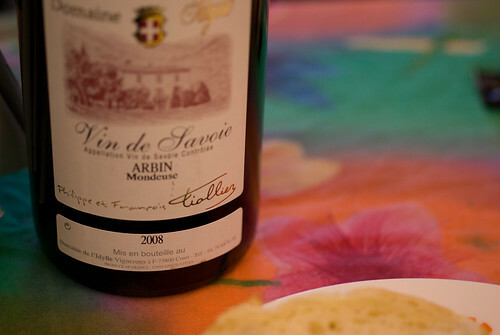 This Mondeuse was a wonderful match with the cheese. 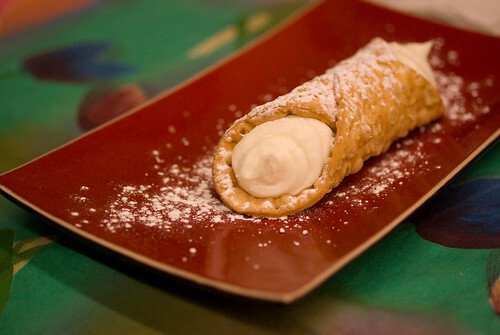 And a cannoli to finish things off. I really liked the sound of John’s suggestion of doing this with queso fresco and tortillas, for a Mexican “raclette” night. He had some incredible goat queso from Gothberg Farms, a local cheese producer (we recently went through two packages of her fresh chevre, it’s delightful), but I’m guessing cheddar would work too. Slough Food rents these little grills out for free, with cheese purchase. 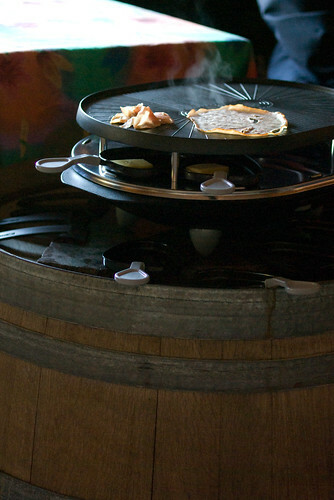 We are definitely having a raclette party at our house this summer. ooohhh… so much fun! I just recently had my first traditional raclette experience as well. what a kick! What’s not to like? 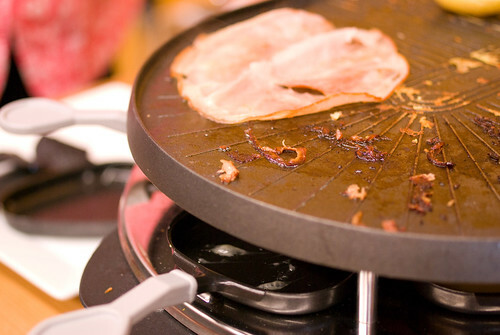 Melty cheese and the chance to play with your food on a hot griddle!